In clear signals that the international profile of Irish marine science has dramatically increased over the last few years (not least because of the the exposure garnered from the INSS) many conferences, some large and prestigious international events, were held in Ireland in 2004. The INSS team took just a demonstrative part in some of them but also played an active part in the planning and organisation of others. 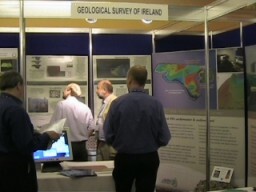 GeoHAB (Geological Habitat Mapping Symposium) was held in Galway from 5-7 May. The GSI and the Marine Institute were co-sponsors of this international conference which concentrated on marine geological and biological habitat mapping. A session was dedicated to INSS together with exhibit stands displaying some of the data. 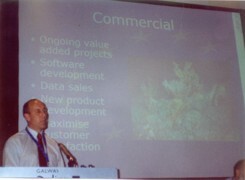 EurOCEAN 2004 was also held in Galway in May (10-13). The Marine Institute, in association with the EU Commission and the ESF-Marine Board, hosted this prestigious conference as an Irish EU Presidency Event. The Conference reviewed marine R&D projects supported under the EU's 5th and 6th Framework Programmes and contributed to the European Marine Research Agenda over the coming decade. The INSS was devoted a special presentation on the evening of the 11th May from 18.00 - 19.30 hrs. We also had a presence at the Ireland stand in the exhibition area. The audience was very international in nature so it was an excellent opportunity to promote the INSS to a broadly based European and international audience. The very successful conference concluded with the agreement of the "Galway Declaration." More details here. 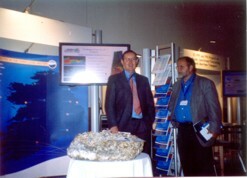 From June 21-22 the INSS exhibited at Energy Ireland 2004 conference. With the INSS providing data of possible real value in the areas of sustainable energy (e.g. possible appropriate locations of new offshore windfarm developments) and alternative energy (locations and understanding of gas hydrates) it was appropriate that GSI should decide to exhbit at this annual conference. Held in the Burlington in Dublin, it provided us the opportunity to pitch the INSS at a slightly more unusual audience than normal. 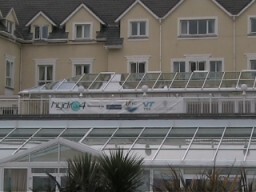 The INSS also exhibited at the Young Scientists Exhibition in the RDS in Dublin in January and then in March at Oceanology in London. Click on the highlighted terms for reviews of each. 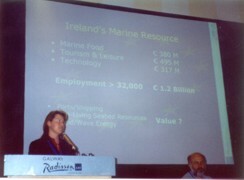 Hydr04 took place in Galway from 2-4 November 2004. This was the Biennial Conference of the Hydrographic Society and this year was the first time it had ever been held in Ireland - a tribute to the INSS's vaunted standing in global marine science. Representatives from GSI met with the conference's organising committee (University of Plymouth personnel on this occasion) in Galway 18 months ago to assist in the planning of this prestigious event which attracted almost 300 delegates from around the world.. Founded in 1972 and with headquarters at the University of East London this society is an international learned organisation maintaining five national branches, in Australasia, the Benelux, Denmark, the UK and US. The Society's principal aims include the promotion of the science of surveying over water and related disciplines as well as the fostering of recognised standards of education and training for those engaged, or intending to engage in hydrographic work. As recognition of GSI's excellent relationship with the Hydrographic Society and the conference's organising committee we decided to attach our own Annual Seminar onto the end of the conference - 5 November, at the same Galway Bay Hotel venue. 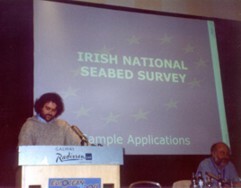 This offered many international delegates, in particular, the opportunity to stay over for an extra night in order to update themselves on the progress of the Irish National Seabed Survey. 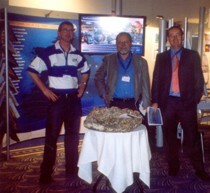 GSI and the Hydrographic Society actively co-operated in the joint promotion of both events. There is an ongoing need to target a couple of conferences each year to publicise the INSS to the international marine science community. 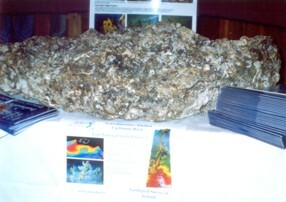 Our exhibit was very popular with a steady stream of attendees visiting the stand and asking for information. Our presence as an exhibitor also facilitated the consolidation of our relationship with several important industry players. Broadly speaking, the conference was primarily attended by Professionals (including Sales Personnel), most of whom, as peers, were in a position to credibly review what we've achieved thus far in INSS, and their feedback was hugely positive. Three talks on INSS were delivered over the three-day conference. Mick Geoghegan (GSI) and Fiona Fitzpatrick (MI) jointly delivered an Overview and Progress Report on INSS, Tommy Furey (MI) delivered a review of Ancillary Projects within INSS and Sean Cullen (GSI) wrapped up the conference with a number of announcements and closing remarks. FEMME '05 will take place in Dublin in April 2005. This is the biennial Kongsberg Simrad forum for Multibeam echo sounder system users. The objective of FEMME conferences is to maximize the real-life performance of Kongsberg Simrad Multibeams; in the context of the Irish National Seabed Survey this objective is of utmost interest to GSI. This is the first time Kongsberg has brought this conference to Ireland, recognition indeed of the international awareness of the importance of Ireland's seabed survey.